Afternoon all, I am currently on my lunch break so I have decided to post now instead of later on as I know that I am going to be exhausted by the end of my shift, we have been flat out. So today’s card is another, yes you guessed it distressed card, I know, I know I have a problem, but I just love these so much……..LOL. I started with a green card for the base card, I then took Hero Arts, Old Letter Writing and stamped it with Ranger, Distress Ink, Peeled Paint, I covered the entire front of the card and also blended the edges, I set this aside to dry. I then took some scratch white card stock and inked up a Hero Arts, Special Edition, Creative Tree with Ranger, Distress Ink, Peeled Paint and spritz it with some water using my Ranger, Mini Mister and stamped onto the white card stock, I then heat set the image and took my sewing machine and sewed around the edges (mind you not very good……..LOL). I then distressed the edges and blended them with some Ranger, Distress Ink, Brushed Corduroy and Antique Linen, I mounted it to the card using dimensionals. 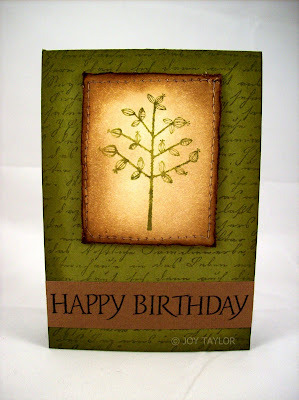 I added a sentiment to the bottom of the card using a brown strip of card stock and stamped a Hero Arts, Birthday Sayings sentiment and glued it to the green card. Enjoy today’s card, I look forward in showing another card tomorrow, and yes it could possibly be another distress card………LOL, I just think when you are on a good wicket and love something then go for it.